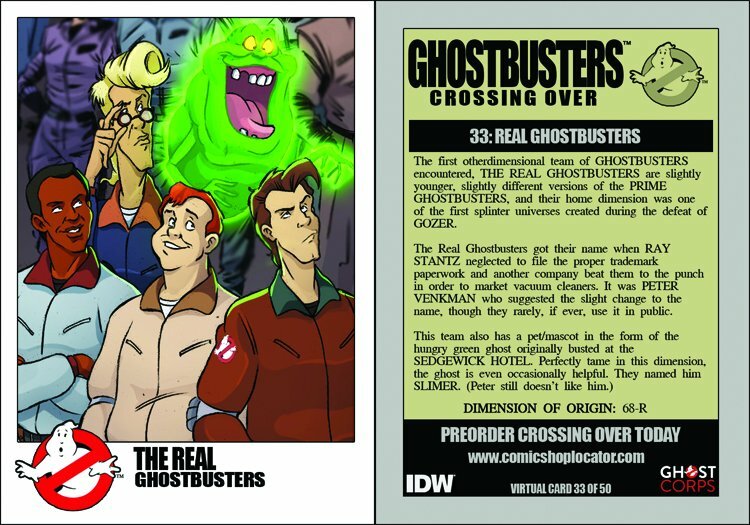 The first otherdimensional team the GHOSTBUSTERS encountered, THE REAL GHOSTBUSTERS are slightly younger, slightly different versions of the PRIME GHOSTBUSTERS, and their home dimension was one of the first spliter universes created during the defeat of GOZER. The Real Ghostbusters got their name when RAY STANTZ neglected to file the proper trademark paperwork and another company beat them to the punch in order to market vacuum cleaners. It was PETER VENKMAN who suggested the slight change to the name, though they rarely, if ever, use it in public. This team also has a pet/mascot in the form of the hungry green ghost originally busted at the SEDGEWICK HOTEL. Perfectly tame in this dimension, the ghost is even occasionally helpful. They named him SLIMER (Peter still doesn't like him).